Effective January 1, 2014, a business located in Tennessee that has between $3,000 and $10,000 in annual sales can obtain a minimal activity license from the county clerk. This license does not require a business tax return to be filed each year. You can either apply for another minimal activity license each year or let the previous one expire. The annual fee for a minimal activity license is $15.00. A business that has annual sales of more than $10,000 each year is required to obtain a county business license. This license is renewable by the 15th day of May each year thru the Tennessee Department of Revenue. The initial fee to obtain a business license is $15.00. A business located within the city limits of Covington, Brighton & Mason, must also obtain a city license. To apply for a Tipton County business license online click here. To renew your business tax online thru the Department of Revenue's website click here. For business tax return forms click here or for questions call (615) 253-0600 or 1-800-342-1003. For more information on starting a new or expanding a current business click here. GENEALOGY INFO Marriages are recorded in Tipton County for the years 1840 – present. To request copies you must submit in writing the name of the groom, bride, and the date of the marriage. The fee for said copy is $5.00 per copy. Wills or probate records in Tipton County Clerk’s office may be obtained for the years 1823 – 1982. The fees for these copies are $5.00 per copy. If you desire certified copies a fee is $10.00 is applicable. If you desire copies of wills after the year of 1982, you must contact the Tipton County Chancery Court at (901) 476-0209, as probate was transferred to that office in 1982. Divorce records in the Tipton County Clerk’s office may be obtained for the years 1823 – 1966. The fee for these copies is $5.00. If you desire certified copies a fee of $10.00 is applicable. If you desire copies of divorces after 1966, you must contact the Tipton County Chancery Court at (901) 476-0209 or Tipton County Circuit Court at (901) 475-3310, as divorces were transferred in 1966 to these courts. The fee to renew a passenger vehicle is $85.00 in the office. If you are mailing in your renewal, the fee is $87.00(extra $2.00 is for postage). Any specialty plate is an additional $36.00. 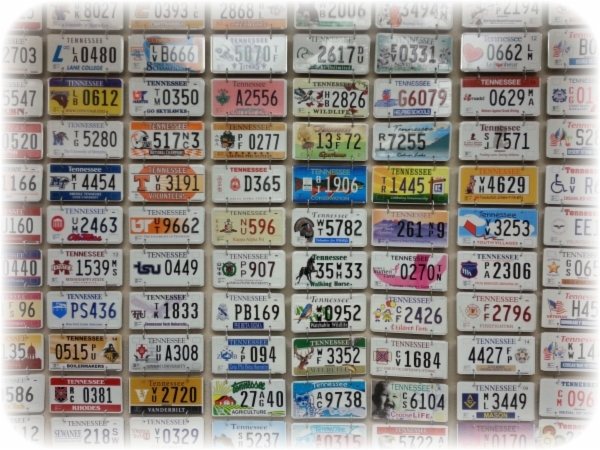 If you have a specialty plate that has been personalized, then you will need to add another additional $36.00. A donation of $1 to promote Organ Donor Awareness is optional. Residents moving from another county to Tipton County must provide two (2) proofs of residency. Click here for a list of acceptable proofs of residency. - Two Proofs of Residency for Tipton County. Click here for acceptable proofs of residency. - If there is a lien on the vehicle, please bring in your current registration from that state and your security agreement or payment book showing leinholder. - If there is no lien, you will need to bring in your title from that state. A donation of $1 to promote Organ Donor Awareness is optional. Click the above picture to view specialty license plates and funding the arts in Tennessee. The license fee is $97.50. The cost is reduced to $37.50, if the couple completes a premarital preparation course from a qualified instructor and submits the Certificate of Completion form when applying for the license. Social Security card must be shown or proof of foreign status. Both the bride and groom must appear in the office to sign the permanent record book. There is no waiting period. The license must be used within 30 days from the date of issue. Both parties must be 18 years of age or older. A driver’s license or certified copy of birth certificate is required for identification. A license issued in Tipton County is valid throughout the United States. NOTARY PUBLIC Notary Publics are elected by the County Commission for a four (4) year term. The County Commission meets on the second Monday of each month to elect Notary Publics. The notary application, $10,000 insurance bond and $16.00 fee should be submitted in person to the County Clerk's office by 12:00 noon prior to the meeting of the County Commission.